Sometimes, I feel like happily-ever-after romance gets a bad rap. “It’s not realistic,” the nay-sayers proclaim. “Just wait until AFTER the honeymoon,” they warn. “Endings shouldn’t always be happy!” they demand. And sure, I get it. Relationships take a lot of work, and too many marriages these days end up broken and dissolved. I’d bet many of you have even experienced a broken not-so-happy marriage or walked through that difficult season with a friend. Hanna and William’s happily-ever-after looked like more of a happily-NEVER-after, and Hanna was fine with that. Until they have to team up one last time… will they find their own happily-mostly-after? But we’ve also made-up, woken up and apologized, reconciled, flung open doors and rushed together to embrace. We’ve clung to each other through our hardships, we’ve raised/are still raising 4 pretty wonderful daughters together, we’ve championed each other’s wins, and we’ve laughed. A lot. So while married life might not be roses and rainbows and smiles every moment, it definitely still HAS some clearance-bought-roses, kid-colored rainbows, and face-aching grins. I like to remind myself that of that when I come to that sigh-worthy ending of a book. First, man. The previous 300 and some-odd pages have most definitely NOT been all happy. In fact, in a good book, there are moments when as a reader I’m not 100% sure there will BE a happy ending. That couple NEEDS a happy moment by the end of a book after what us authors throw at them! But a happy book ending doesn’t mean conflict won’t come, but it’s also okay to savor those good moments. Remembering the good is what helps make going through the tough stuff more tolerable. Remembering the sigh-worthy moments that will eventually come helps you trudge through the messy work of relationships. So here is to happily-mostly-afters! May your marriages be full of laughter, love, and really good make-up kisses!! Want to win a copy of a romance that most certainly did not have a first happy ending? 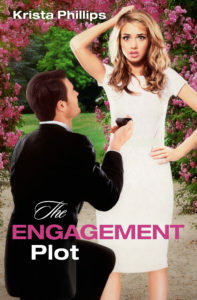 Comment for a chance to win a copy of The Engagement Plot!! Gosh, I got goose bumps reading your post. The ending could be HEA, but the road to HEA is always difficult. Thank you. Yup, it definitely is! But so worth the ride!! Hi Kirsta, congratulations for October- 19 years:) Thanks for your thoughts- this made me think of for King & Country’s song ‘Pioneers’ that I have been listening to a lot lately. I am blessed to walk through life with my best friend and to face the challenges that life throws up along that journey. I hadn’t heard that one yet so went and listened! A cool song!!! And so true! I am like you, marriages do take work but it is worth it if you are with the right person. Some trails and troubles are really hard but I know when I am happy or something in life goes wrong who I want to be with and who I know will comfort me when I am sad. I am looking forward to reading your book. Yup! There is no one else I’d rather go through the bumps and topsy-turvyness of life than my husband!!! We married young at twenty. We have had our rough spots, too. But Christ held us together for 49 mostly happy years. Let’s face it , even here in privileged America….. this world is a battleground! We are thankful that Christ found us and keeps us. 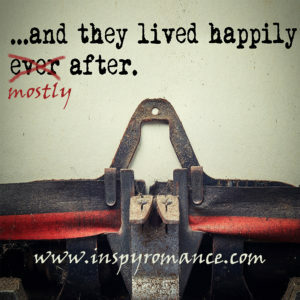 We are living our mostly happily ever after! Thanks for sharing your inmost thoughts and struggles. We are , after all, sinners, saved by Grace! I married young too… I was 18 and he was 21!! I’m so thankful for each and every year we’ve had together!! I LOVE happy endings! The complaint that happily ever suffers aren’t realistic is exactly why I love them. Life is hard. Marriage is hard. Books are fun. No idea why after autocorrected to suffers. And I’m with you!!! I need me a HEA ending, because life IS hard and especially during my low times, I need to remember that it isn’t always like that, and that joy WILL come in the morning. Been married 41 years and it has NOT all been happy. But, we glorify God better together, and that is our goal. I love HEA endings because there is too much sorrow in the real world, and they encourage me to work toward HEA in my own life. Congrats on 41 years!!!!! And I am with you, I <3 a happy ending!!! Definitely!!! I tend to write stories that are heavy on the struggles. II don’t know why, but a large majority of my books, there Hero and Heroine pretty much despise each other at the beginning. I don’t plan to write them that way, it just happens! LOL! but it is so much fun seeing that firey relationship turn into a different kind of flame. That’s cute, I like those too! Thanks for this blog. It was very interesting. Have a blessed day. Hi Krista! Congrats on 19 year Anniversary. Our oldest son has an October anniversary – 18 years. Love is a choice through thick and thin with many blessings that is the HEA – all 45 years. Best wishes. Enjoy your Labor Day! Congrats on 45 years!!! Agreed, love is a choice and sometimes a harder choice than others!! I love happy endings!! In fact, if a story doesn’t have one that I’m satisfied with, I’m disappointed. I think I’ve read that the marriages that don’t fight a bit are the ones that often don’t last… they aren’t willing to fight, period. Even for each other. On the other hand, I know a couple that have been married 25 years, raised 4 great kids and don’t fight. And… he’s a cop! They, like my husband’s profession, have high stress – PTSD is a when not if- if they do it long enough. Divorce rates through the roof, same as firefighting. I think for them, as us, marital success is a combination of Jesus, prayer, and the wives knowing the score and being willing to make accommodations. Some days will be bad as they deal with a hard call. I’m willing to bet that couple DOES indeed fight… they are also probably good at doing it in private! Sadly, some marriages I thought were like super amazing ended up in divorce… as they were just really good at acting happy out the outside. I agree, learning to fight–or maybe better said, learning to handle conflict–is a super important component of marriage!!!! Happy Anniversary, and you are oh so right. 20 years here, and if we didn’t have Christ, especially during those rough times, I probably would have been a mess wondering if we were going to get through it intact or not. Agreed, Andrea! And yeah, so glad you enjoyed it!!!! In the Marriage Vows you promise to take each other for Better or for Worse , in Sickness and in Health, and to Death til you Part. If I had known 42 years ago that would include Colon Cancer, Prostate Cancer, Broken Leg, Re-Connective Surgery from the Colon Cancer, and a Broken Neck which took a year to recover from, I might have backed out. But we both took our vows seriously and before God & man too. Here’s to another 19+ years of Love & Happiness. Yup, we’ve definitely seen better and worse, and are so thankful God has brought us through! Celebrating 33 years. The highs and lows wouldn’t change a thing!! Thanks for a chance to win. Thank you so much for the blog My husband and I had been married 35 years when he passed away 10 years ago it was always a bed of roses My the Lord was right there with us to keep going Thank you all for this awesome giveaway! Oh yes, me too!!!! It’s fun adding those little cameos!!! We just spent the weekend with our kids in the area and our visiting kids. It was a lot of fun. We’ve been married 38 years and counting. Life has thrown some challenges our way but God is able. My two daughters are happily married and know to make it a priority to work through differences. I’m praying for God to send my son his special someone. Cheers to happily-mostly-after! No need to enter me in the giveaway; I already have a copy of the book and loved it! Ya know, I understand people complaining about how life is not always a HEA, but that’s one of the reasons I like reading them – as a reminder that even when life is tough, with God, there is still a happily ever after! Eventually. My husband and I will be celebrating our 25th anniversary in January and it’s only because of and by the grace of God, that we’ve come that far. Satan has thrown a lot of obstacles in our path, but we’ve come through stronger and more in love than before. I like to read to escape to a HEA. Life is messy but good, but a book sure goes by at a faster pace to get to HEA, and that is fun for me! The road to a HEA is rarely smooth, but so worth it. We recently celebrated 30 years of marriage. Not every year (day) has been glorious, but I think most have been. I today’s divorce minded marriages I am happy to say we are still hanging in there. Thanks for sharing! We will be married for 19 years this October also and it sounds almost exactly like yours. Through the pain and trials comes joys and happiness. Our four children keep us on our toes but I wouldn’t have it any other way. Congrats on your adventurous 19 years! Please enter me. 39 1/2 years with one and only one man. Only one I ever kissed. I really enjoy reading happily-every-after because they are way far from reality and provide a nice escape, but that’s not real life. I love HEA ….or not! Characters aren’t perfect and neither are they’re journeys, but the HEA makes it all worth it. Sure, the story could stop in the middle of the conflict (and when we face our problems, we find ourselves in the thick of it) but it’s so much better when we, as readers, complete the journey with our characters. It’s hopeful and a promise that no matter what we’re facing we can come out of it, too.